If you are unfamiliar with it, please check it out. I have created this page here, because I require some assistance. I have fulfilled all of the other program requirements- paperwork, shots, etc. and now all I have left is to raise the funds for airfare. Round trip tickets run around $2000-3000 (yes, this is steep). I am making this site requesting my friends, e-friends, and those who just want to help get an Afrikan person back home to experience Afrika first-hand. For those who already know me and/or who agree with the site, know I will not be going over there as a tourist. I will be going "home" to see the real Afrika, separate fact from fiction, and be amongst the real Afrikans, not those who want to give up their traditions to follow the trinkets of europe. We know what that has gotten us over here and I definitely don't want to duplicate that at "home." Also, for those who do not know me, I have dedicated the last 10 years to the serious study and inquiry into our Afrikan reality and am transforming my life to be in line with it. 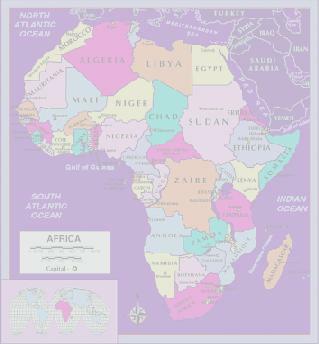 I have created Afrikan-centered newsletters and helped with Afrikan-centered newspapers (The Drum Code, Connecting Afrika's Children, and The Naked Truth respectfully). I have done numerous lectures from "The Psychological Effects of Foreign Religions on the Psyche and Behavior of Afrikans in america" to The Coming Race War" to "Using Our Afrikan Culture to Transform Your Life." I am a member of the Pan Afrikan Association of america-6 years running, and current President of its San Diego State chapter, I was also the former Historian for the Association of Black Psychologists-San Diego Chapter and former President of the Afrikan Student at San Diego City College as well as former Activities Coordinator for the A.S.U. at San Diego State. So as you see, Afrika is WAY MORE than just theory for me. What I would like from you, faithful and soon to be faithful followers of the Spirituality site are sponsorship/love donations: $5, $10, $20, $50, $100, etc. It could be dirt (I had a friend go to Senegal and I had him bring me back a rock and a small container of dirt and I have it on my Jingili (altar) as actual Afrikan energy to enliven my shrine); artifacts, clothes, authentic Afrikan fabric, instruments (like a mbira-finger piano), any Afrikan games that the people of Zimbabwe may have, etc. Since the vamudzimu (Ancestors) have brought me this far, I know they will not let the mundane, yet important area of money hold me back from going home and experiencing what I need to experience to help my own growth or experiencing what I need to help Afrikan people as a whole, hence the idea to create this site. I will also keep everyone interested up-to-date with how close the goal is to being reached. The last day to send your donations & requests should probably be January 31st as I have to be there by February 3rd! So, the sooner, the better, please. San Diego, CA 92165 2325 Laconia St.
LET ME SAY BARKA, NDATENDA & ASANTE SANA (Three Afrikan words for "Thank You") in advance to everyone who will help finally make my dream come true and for those who will live their dream indirectly through me, until it is my turn to help you get back "home." THOSE WHO HAVEN'T SEEN ME. I WILL BE AT THE UNIVERSITY OF HARARE, THE CAPITAL.